You might call that a cliche, but how many others can you name that have covered the thousands of miles and played the amount of shows that HM&TC have, in just two years? Oh, and they’ve managed to write, record and release a critically acclaimed album and start their own record label in that time too. Since then the bombastic folk rockers have been on what seems like a never-ending tour,; playing over 300 shows, 60 festivals (including Glastonbury, Secret Garden Party, Wilderness, Boomtown and Bestival) and tearing through trips around Italy, the Netherlands, France, Portugal and Germany. 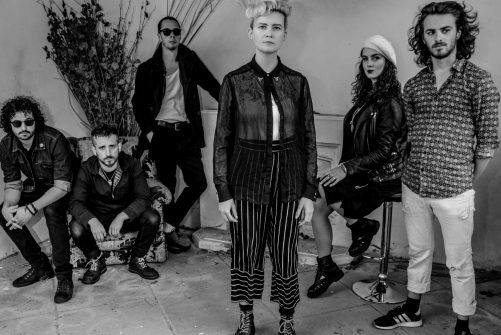 Wowing their raucous and ever-expanding fan-base with instrument-swapping, squeezebox-growling, fiddle-shredding, brass-howling hoe-downs, the group have been able to hone a sound that is organic and invigorating – forged in the sweat and heat of the live show. In 2017 Holy Moly & The Crackers stepped up a gear. They signed a deal with Wipe Out Music Publishing and, working with producer Matt Terry at the legendary rock studio VADA, recorded and released Salem – a record that’s been described as “a new kind of sonic madness” by music magazine and long time supporters, Narc. Now it is 2018. 22-year-old Nick Tyler has joined on guitar. Classically trained but influenced by psychedelic and DIY punk in equal measure, he is the final piece of the multifarious puzzle that is Holy Moly & The Crackers – the final Cracker, as it were. This year HM&TC will release two stand-alone singles, recorded by Matt Terry and mixed by Dan Austin (Pixies), and back the songs up with with major international festival appearances, including a main-stage appearance at Beautiful Days and Colours Of Ostravia in the Czech Republic, before embarking on their biggest UK headline tour to date in November. This is a standing show. Presented by Please Please You & Hey! Manchester.